If you are trying to print from Adobe Reader on the SureDesk™ and the program crashes you will need to follow the simple steps below to get the programs to work correctly. Even if the settings are corrected, the program may rarely reset these settings and you will have to follow these steps again. 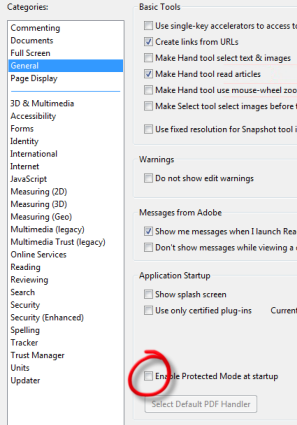 In Adobe Reader open Edit in the tool bar and select Preferences. Under categories make sure General is selected. Make sure Enable Protected Mode at startup is unchecked.